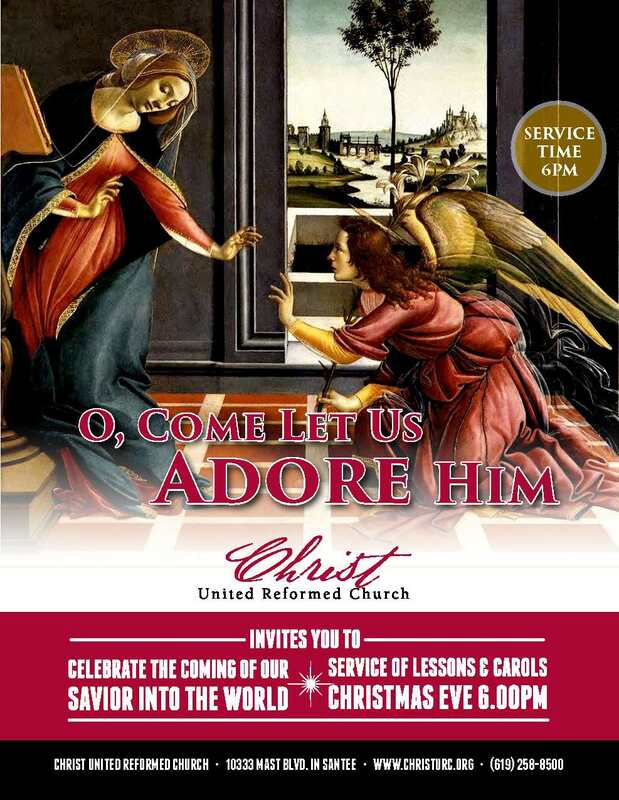 Join us this Sunday evening, Christmas Eve, for our annual Service of Lessons and Carols. This service engages our minds and grips our hearts as we are drawn into the story of the birth of Jesus of Nazareth: God’s Son, Israel’s Messiah, and our Savior. We hear the Scriptures read and briefly explained as we trace the history of salvation: beginning in the Garden, moving through the Patriarchs and Prophets, culminating in the Gospels, but also looking to the future and the return of the God-man to this earth. So let us prepare ourselves as we again learn of the greatest drama ever staged in the history of mankind: the coming of God in the flesh! The new Reformation Italy website is up and running! Have a look, sign up for the monthly newsletter, and be sure to visit the blog, which will be updated with articles on the Reformation in Italy, both then and now. "It has been almost five centuries since The Benefit of Christ was first published. The Lord once used this little book to help people understand the gospel and spread it across Italy and Europe. What will he use today? May we return to the message of The Benefit of Christ and proclaim that message once again." Today is Pentecost Sunday, the last of the five main calendar days in the liturgical year: Christmas, Good Friday, Easter, Ascension, and Pentecost. The historic Christian church has celebrated Pentecost in commemoration of Christ’s mighty act of sending the Holy Spirit upon his new covenant church, as recorded in Acts 2. This event happened on a Sunday in Jerusalem at the annual Feast of Weeks, one of the three great pilgrimage festivals. In Leviticus 23, God commanded Israel to keep the Feast of Weeks (Shavuot in Hebrew) exactly fifty days (seven weeks and one day) after the Passover Sabbath. This was a summer harvest festival, a time of giving God thanks for his provision. By the first century A.D., when Greek was the common language of the civilized world, the Feast of Weeks became known as the Feast of Pentecost. The word “Pentecost” is a transliteration of the Greek word pentekostos, which means fifty. It was at this annual Feast of Pentecost, when the city of Jerusalem was filled with Jewish pilgrims from all over the Roman Empire, that Christ sent the Holy Spirit upon his apostles just as he said. They were filled with boldness and began preaching the gospel to the crowds unashamedly. Three supernatural signs accompanied their preaching: a rushing wind, flaming tongues of fire, and the ability to preach in foreign languages. The sign of a rushing wind signified the Spirit’s life-giving presence. The sign of tongues of fire signified the cleansing and purifying holiness of the Lord. The sign of foreign languages signified the gospel going out to the Gentiles who would now be made disciples of Christ and children of Abraham. Pentecost Sunday is important to observe and remember. It is part of Christ’s earthly ministry, his last great work in his first advent. When we think of the finished work of Christ, we have a tendency to think only about his life, death, and resurrection. We might tend to forget the significance of his ascension into heaven and his sending of the Holy Spirit ten days later. Without Pentecost, though, his work would have been incomplete. Without Pentecost, the gospel would not have gone out to the nations. Without Pentecost, we would still be in darkness. With the Christian church of the ancient, medieval, and Reformation periods, we celebrate Pentecost Sunday in remembrance of Christ’s finished work, which culminated in his sending of the Holy Spirit. We give thanks to God that the Holy Spirit testifies of Christ throughout the world whenever the gospel is proclaimed, convicting the world of sin, righteousness and judgment (John 15.26; 16.7-11). We give thanks to God that Christ has not left us as orphans in the world, but has sent the Spirit who has brought us into union with Christ and is sanctifying us through his means of grace. We give thanks to God that the Holy Spirit preserves our faith and equips us for a life of service. Loved ones, let us give God thanks today for Pentecost, that great event in redemptive history that has inaugurated the new creation, formed the global church, and empowers Christ’s kingdom on earth until his return!